Numbers are hallowed in Major League Baseball. I likely don’t have to tell you what the single-season home run record is or how many career leader Barry Bonds has. Or what Joe DiMaggio’s consecutive hits record is. Or the last player to hit .400 or win 30 games. In the NFL, things aren’t quite as number-driven. But we may see a few big-time marks fall in 2012. Hall of Famer Eric Dickerson holds the NFL record with 2,105 rushing yards, while fellow HOFer Jerry Rice has the single-season receiving yardage number with 1,848. Both are under siege, and Bovada offers props on each. Minnesota’s Adrian Peterson leads the NFL with a career-best 1,812 rushing yards, and, thus, would need 294 yards to break Dickerson’s record. Peterson has topped 294 in a single game before, setting the record of 296 in 2007. Bovada asks whether Peterson breaks the record: “no” at -300 and “yes” +200. Peterson has had eight straight 100-yard games, including two topping 200. Looking at any two-game stretch in that run, (i.e. Week 1 + Week 2; Week 2 + Week 3, etc.) Peterson would total more than 294 five times. But it’s not exactly easy to average 147.0 yards – he’s at 129.4 right now. The Vikings face a very good Houston run defense this week and then a so-so Green Bay one next. I don’t think he gets the mark, but if he gets halfway there against the Texans (and I say no) he just might, because the Packers may rest starters in Week 17. Meanwhile, the Lions’ Calvin Johnson is on a similar role. “Megatron” has had seven straight 100-yard games and leads the NFL with 1,667 receiving yards, and, thus, needs only 182 to break Rice’s mark. Will Johnson break the mark? Yes is -200 and no +150. That feels like a lock to me. Matthew Stafford has targeted Johnson an average of 17 times per game in the past four. The Lions have squat to play for, so I believe they will get Johnson the record – I wouldn’t even rule out 2,000. Even though I think he gets it, no is probably better value. One tweaked ankle and the chase is over. Meanwhile, the circus that is the New York Jets continued this week with the team finally benching turnover-machine Mark Sanchez. No. 2 Tim Tebow isn’t starting this week vs. San Diego, but third-stringer Greg McElroy is. Bovada offers a prop on the Jets’ starter for Week 1 next season: Sanchez (+120), another quarterback (+125), McElroy (+250) or Tebow (+1200). It will either be another QB or McElroy. Sanchez likely will be cut, although that will be very costly. Tebow will be traded for a late-round pick – more on that in a minute. So will McElroy show enough in two games to earn the starting job heading into camp? A lot may depend upon whether Rex Ryan returns. But I would lean toward McElroy only because you know he will at least be on the roster. You hear rumors the team wants Michael Vick, who no doubt will be available. But isn’t Vick about the last thing the Jets need? He tends to turn the ball over as well and can’t stay healthy. And what will Tebow’s future be? Bovada’s options for Tebow in Week 1 2013: Jaguars (3/2), Jets (5/2), any CFL team (11/2), Bills (6/1), Chiefs (7/1), Raiders (10/1), any UFL/AFL team (15/1). First off, Tebow would be a monster in the CFL, but that’s not happening. It clearly will be Jacksonville. The Jags’ QB options right now are Blaine Gabbert and Chad Henne. Tebow almost went to his hometown Jags in trade last year but decided to go to New York when the Jets promised him a shot to start. Oops. Tebow will be a Jaguar next season and help get fannies in the seats for a franchise that badly needs some buzz. Thanks to a stunning comeback (that fell short) and throwing a career-high 65 passes, Tom Brady torched the 49ers for 443 passing yards last week to easily lead the NFL. My choice, Drew Brees, had a solid 307 yards against that No. 32 Tampa Bay pass defense. On the rushing yards, the incomparable Peterson led the league with 212. I thought the Rams would not allow him to beat them, but he’s just that good. I liked Baltimore’s Ray Rice, but I won’t be picking a Ravens offensive player the rest of this season. On the receiving yards, I liked the Lions’ Johnson, and he had yet another 100-yard game. But the winner was New England’s Brandon Lloyd with 190. I liked New Orleans at +400 to score the most points in Week 15 and it had 41. That usually is enough, but suddenly-crazy Seattle put up 50 again. Sportsbook.ag doesn’t yet have the player props active as of this writing. So I will just give you my choices and you can check the site later today. For the highest-scoring team I like Green Bay at home against Tennessee, which is on a short week and allows 28.3 points per game. The Packers still have plenty to play for in terms of a bye, but look for them to rest Aaron Rodgers in Week 17. 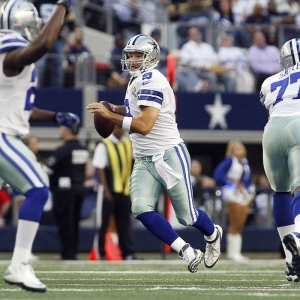 I love Tony Romo to throw for the most yards as Dallas hosts New Orleans and its No. 31 pass defense. On rushing yards, take Arian Foster to outduel Peterson against the Vikings. And for receiving yards, I am going with Johnson again (Saturday vs. Atlanta). He wants Rice’s record and is the only offense the Lions have.